We provide B2B payment technology, platforms and partner integrations to qualify the growing use of commercial and purchasing card spending at the lowest Visa Level 3 and MasterCard Data Rate 3 Interchange rates. From a feature rich virtual terminal solution to enterprise eCommerce and ERP platforms, covering electronic invoicing, recurring billing, and one-click repeat customer payments - let our B2B payment advisors help you source and implement the most secure B2B payment technology to meet your needs. To take advantage of corporate, business and purchasing card Interchange, merchants must implement payment solutions that meet the more complex requirements of Level 3. Standard credit card terminals are not capable of supporting Level 3. Payment solutions on the market that support Level 3 include payment software that can be licensed and installed on a PC or a virtual software service that can be accessed through a secure web site application. We recommend using a Software as a Service model to avoid having card data stored on local systems that must be secured. And with evolving Level 3 requirements, this hosted approach always offers the most updated solution version and multiple users can access the service on any computer with Internet access without traditional software licensing, installation and upgrade issues. Virtual Terminal (no integration needed and no software to install, simply use your web browser to securely log in to process transactions). API integration to our Real-time Payment Gateway (use our API technical specs to integrate your in-house application or web site to submit Level 3 data). Level 3 integrations with leading providers like Bill.com, Splendid CRM, hybris B2B ecommerce, Greenestep-Everest and Informedia ERP, just to name a few. 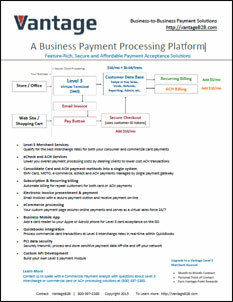 Payment modules for repeat and recurring payment transaction processing and Electronic Invoice Presentment and Payment. Key-enter Level III transaction in to the Virtual Terminal accessible via a web browser on any internet-enabled computer. Connect an EMV card reader to the Virtual Terminal. Add the optional Shopping Cart and accept Level 3 transactions online. API integrations into your core business processing systems. Set-up Recurring Billing and Invoiciing payment modules to accept Level 3 transactions. Upload Level 3 transactions through a CSV file with the Batch Processing option. Process Level 3 transactions through Mobile devices. All processing methods have access to the Virtual Terminal in order manage and view transactions. Merchants are prompted to enter Level 3 data only for transactions that will benefit from adding the data, significantly reducing excessive data entry. Saftey net defaults can be set to pre-populate Level 3 data fields with applicable information. Auto populate data for Level 3 transactions or add Level 3 data at any point before settlement. Secure Checkout provides tokenization for off-site and PCI secure customer and payment data storage.